Says Obama has changed "the conscience of everyone ... about African-Americans"
WASHINGTON (CNN) -- On his first day on the job, Kevin Lewis almost didn't make it into the White House. 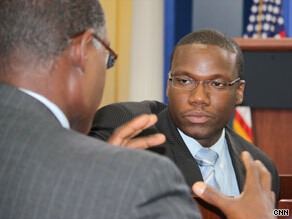 CNN's Dan Lothian, left, talks to White House press assistant Kevin Lewis. "I tried to go though the EEOB [the Eisenhower Executive Office Building, located next door to the White House] because I didn't actually know I could walk through the front gates of the White House." Lewis, 26, is a White House press assistant, wrangling the press from event to event and traveling with President Obama across the country and around the world. The journey through those White House gates was far away for Lewis when he was a boy in Brooklyn. Raised by a single mom, he didn't have many role models but he did have the drive. "I knew there was more outside of my section of Brooklyn," Lewis said, "and the challenge is I didn't have enough people around me to tell me, I didn't have the example, I didn't have another person in policy saying, 'Hey, this is what you should be doing.' I pretty much just went." And away he went. Kevin traveled with Obama's presidential campaign around the country to states like Michigan, Nevada, and Pennsylvania. He now travels with President Obama to places like Egypt, Trinidad and Germany. But even with a passport full of stamps he still remembers his hometown roots and the responsibility he feels as an African-American. "I lived right down the block from a housing project and not just that, I mean, folks from my block, they're still there, and a lot of times I need to be the one -- the one to pretty much set the example. "So now I'm in that position where I can do that and it's not just young people, but just about everyone. They see me, I'm walking through the gates, I'm walking in, and I see older folks just look at me, and they say, 'Wow, he's in the White House.' "
Lewis feels the importance of what his presence at the White House means. He sees the pride that many people feel -- especially older blacks who once faced harsh discrimination -- and believes he provides a connection between ordinary people and an extraordinary place. "It's sort of like they see their young son, whether their young son is there or not, it's almost like they take, they adopt me." Lewis said. "[It's like] well, their son is there, some one they know is there. "You can't really put a price on what I'm doing and you can't put a price on what it represents [to the African-American community]." Lewis said the possibility of an African-American president "wasn't in my imagination." But now he sees the possibilities for him in this administration and beyond. Whether he could have imagined it or not, Lewis knows what having an African-American president means to him and others. "The conscience of everyone in this nation and around the world has changed about African-Americans. Period. He's us, he represents us, now that we have that, it changes the game, he's a game-changer."